Follow my latest work on my Tumblr! I'm in a group show with the lovely four foxes studio! At Grumpy Bert, featuring myself, Aya Kakeda, Debra Ziss and Jannese Rojas. The opening reception is November 4th from 7-9PM, the show is on view until November 27th! Also coming up on the same weekend, Comic Arts Brooklyn! Find me at table D27! I'll be in Bethesda for SPX! I'll have a ton of new stuff! Including new prints and new mini accordion silkscreen series, I'll be at table B8! In Chicago for CAKE! I'm bringing a new mushroom girls silkscreen print as a soft debut. Come and get it! In Portland for Linework NW! I have a new riso-printed mini accordion zine debuting there, "Plant Life". I have a piece in "Silent Wonderment" a group exhibit exploring the world of Giant Robot! The opening reception is this Saturday, the exhibit will be on display April 23rd to July 2nd at the Vincent Price Art Museum. Please check it out if you're in LA! I'm tabling at MoCCA this weekend! This year it's in a new location, the Metropolitan West. Gonna have a new zine debuting this weekend, updates will be posted on my tumblr. If you're in NY, check it out, it's gonna be great! I have a couple of new paintings in a group show at Flower Pepper Gallery in Pasadena, CA! Check it out! I'm also in town for LA Zine Fest, which takes place Sunday, March 6th! Go here for more info on LAZF, it's going to be a great show! I painted on some red envelopes which will be on display at Grumpy Bert's Red Envelope Show! Opens this Saturday from 6-8PM, if you're in Brooklyn, stop by! Starting the year off with Year of the Monkey show at Giant Robot! Flip Book show, opens the same weekend in Brooklyn at Grumpy Bert! This one is going to be amazing! This weekend I'm tabling at CAB! If you're in Brooklyn, stop by! Heading all the way to Seattle forShort Run! It will be my first time in Seattle and Short Run, so I'm stoked! I am traveling with Joel Alter to Boston this weekend for Boston Zine Fest! We are both exhibiting! Joel will have some new notebooks to sell with custom silkscreen pattern and I reprinted "Girl Galaxy" especially for the weekend. Be sure to stop by! I will be exhibiting at SPX this year! I'll have all of my new silkscreen prints to sell, and possibly a new travel journal/zine to debut if I can get it done in time. ;) See you there! I am visiting Minneapolis for the first time for Autoptic! I am debuting a new series of silkscreen prints! Be sure to check out my tumblr for process photos of these new freshly made silkscreen prints. Autoptic is a 2 day festival and it's free to attend! See you there! I have 2 new pieces for an event at the Honolulu Museum of Art! The event called Art Shop is a week long event that runs from June 19-28th, curated by Giant Robot. There will be talks, demos, and the exhibition which features dozens of artists from all over. If you are in Honolulu be sure to check it out! I have a piece in a space themed group at Grumpy Bert! Opens May 29th in Brooklyn. For the latest updates on art shows and events, check out the Grumpy Bert website! Heading to Toronto for TCAF! May 9th and 10th! I'm upstairs at table 256, if you're in Toronto come check it out! I have a last minute riso-printed comic/zine debuting this weekend called "All About Flower Girl" so look for it!!! MoCCAis this weekend, April 11th and 12th! Find me at table 346, I'll be on the same row of tables with all my studio mates and friends! I'm heading to Providence on the last weekend of March for RIPE! I'll be in a panel on Saturday, check out the programming here. Also gonna try to push a new zine out for it, check out my tumblr for updates on that! I'm in a group show at Giant Robot in LA! Be sure to check it out! On view until March 11th. I'm exhibiting at Paper Jam this weekend, February 7th at Silent Barn in Bushwick! Check out Paper Jam's tumblr if you wanna read about all the great exhibitor's involved! I have some pieces at Giant Robot's 1st show of 2015, text and pictures! If you're in LA, check it out!! I'm going back to San Francisco for APE this weekend! I'll be traveling with a bunch of my studio mates (old and current!) and we're taking over several tables at APE's new/old spot this year at Fort Mason Center, check us out! We'll be at tables 120-122! Hey folks! SPX is only a few days away! Find me at table C1. I'll have some of my older zines and a ton of new prints, zines and comics! This weekend I'll be tabling at SF Zine Fest! I'm sharing a table with the amazing Joel Alter Come check out all the new stuff we'll have this weekend, at the County Fair Building in Golden Gate Park! Joel will be selling all new sets of handmade mini-journals, I have a new zine "Witches Brew" available this weekend! Hi folks! This weekend I will be tabling at the new RIPExpo in Providence, RI! Make sure to stop by as I have a new array of silkscreen prints, for a preview, check out the latest on my tumblr! Hello folks! I'll be exhibiting at CAKE next weekend in Chicago! I'll be tabling with the lovely Yumi Sakugawa. :) Find us at table 79B! I'm exhibiting at MoCCA Fest this weekend! Find me at table C19 where I'll be selling all new mini-accordion series plus tons of prints, zines, totes and other things! I'll be exhibiting alongside the amazing Joel Alter plus all of my studio mates. Don't miss it! Happy Chinese New Year! 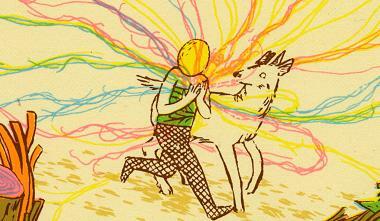 I have a new painting in Giant Robot's Year of the Horse show! Opens tonight! Happy New Year, folks! I have a new watercolor piece in a show featuring modern interpretations of the classic pin-up! The show is organized by one of my studio mates Chris Butzer, and features a great line up of artists, including all of my studio mates! The opening is this Friday at Shag in Williamsburg, don't miss it! I'll have post-it's at Giant Robot's annual Post-It show! Opens this Saturday, all post-its $25, cash and carry!! I'm exhibiting at Comic Arts Brooklyn this weekend! Find my table downstairs. I did a last minute collaboration with my good pal Jon Vermilyea on a brand new riso print mini zine. Look for it at both our tables! Dead Man's Party opens at Pony Club Gallery on Thursday, check it out if you're in Portland! It'll be a great show! Picture in Picture, a Comics show opens tomorrow at Launchpad in Brooklyn. I'll be in attendance along with many friends and colleagues. Come and have a good time! Landing in San Francisco tomorrow for APE this weekend! I'll be at table 613 with a bunch of silkscreen books, zines, posters, and loads of stuff. I'll be at SPX this weekend! Find me at table W39 with my silkscreen book, prints, and riso zines. Plus I'll have the riso flyers I did from a recent music collaboration/music show "Creature Mines" up for sale! I will have all new pieces for a group show coming up at Giant Robot! "Stories" will feature new works by me plus Edwin Ushiro, Jeni Yang, Martin Hsu, Sean Chao and Tessar Lo! Here is the press release for the show, it's going to be amazing! Don't miss it, opens August 17th. Coming up is CAKE! Hopefully I will have a new riso-printed mini by then. (Working on it right this moment!) See you in Chicago! This weekend is Grand Comics Festival! I'll have my books and prints available for sale. Also happening this weekend is the bar party Saturday night at The Grand Victory and a special after party at our studio! I'll be at TCAF this weekend! Find me on the second floor where I am tabling with my studio mates, Aya, Tory and Chris. It's gonna be rad! I made a new print and a new painting for this group show at Pony Club Gallery! The exhibit will be up during Stumptown Comics Fest as well. Here is the facebook event. This Saturday, don't miss LA Zine Fest! I'm gonna have copies of my new book, fresh off the printers! "Pink Lemonade & Find My Light", published by Paper Ink Glue. Plus, if I can manage to get it done in time, I will have a new risograph printed zine (thanks Jon Vermilyea!) titled "Girl Galaxy" available at the show. That's right, two new books! Plus, I will have some new and exclusive silkscreen prints for the show. This is seriously gonna be awesome and I can't wait for this weekend. Check it! TOO MANY THINGS going on in the month of February, here are the first three things!! My solo show, "Creatures of Ghost Island" opens this Friday at Allegory Gallery and will be up for all of February! Take a look at my blog for some preview/process photos of the new work. Opening this Saturday is "Year of the Snake" show at Giant Robot in LA! I have a piece in the show, plus I will be making a trip to LA in a couple of weeks, details to follow! I have post-its at Post-it Show 8! At Giant Robot LA, opens this weekend. $25/post-it, cash and carry. Over 260 artists!! Go check it out! My final show of the year is Brooklyn Comics Graphics Fest! I will have the last copies of the first printing of my Nature Nurture zine, along with silkscreen prints and my other books. Find me at table D20! I'm in the Bay Area for APE next weekend. I've exhibited at APE for a bunch of years in a row now and it's always a good time. Be sure to stop by, it's all weekend at the Concourse Exhibition Center in San Francisco. I'll be there with the incredibly talented Jon Vermilyea, find us at table 617. I will have copies of Nature Nurture, some copies of my other screen printed books while they last, and festival exclusive prints! Heading to Bethesda this weekend for SPX! I will have my new zine available, called Nature Nurture, fresh off the printing racks. I am sharing a table with the lovely Jess Ruliffson. Find us at table D12. See you there! I have new pieces in a group show at Alternative Cafe which opens in July! Everyone involved in the show also makes books so the gallery will have copies of each of the artist's books available to look at and purchase. If you are in Monterey, don't miss this! My next stop is Chicago for CAKE Fest coming up in June! The guest and exhibitor list looks amazing and the table map is now up on their site. I'll be at table #53. Also, I'll be participating in a panel called "Silkscreened Comics: How Technique Changes Language". More details on that soon! *update 6/8, The CAKE website now lists all the panels that will go on over the weekend and there are a lot of great ones! The one I am participating in takes place Saturday from 5-6PM, called "Low Brow, High Mesh" about silk screened comics. Check it out! I have some new prints in an upcoming group exhibition at Pony Club Gallery in PDX! It is a ghost themed group exhibition, if you're in Portland, check it out! The show opens April 5th and runs throughout the month of April. I have a table at LA Zine Fest coming up in February! I'm hoping to have a new silkscreen book by then, crossing my fingers. Excited to visit LA again. I'm also getting stuff ready for Portland. More news on that soon! I have some post-its in this show which opens tonight! At Giant Robot LA, go here for rules on how to purchase post-its on opening night. The show will remain on display until the end of the month. I'm planning on updating my site soon with some new things I've done this year so stay tuned. For now, my newest silk-screened mini "don't follow me" is now up on this site! Coming up is Brooklyn Comics and Graphics Fest in Williamsburg, Brooklyn. This is a one day festival which will take place December 3rd, from noon til 9PM. I will have books and prints available, don't miss this! I will have books and prints at a table at The Whitney Museum's Zine Party! Organized by Desert Island. Be sure to stop by! This Saturday from 1-4PM. The Monterey show travels to New York! Opening reception is on Friday evening, September 30th at My Plastic Heart Gallery in the Lower East Side. I'm tabling at APE again this year in San Francisco, taking place the same weekend, October 1-2nd. My table # is 540, I will have new books and prints plus plenty of other goodies, be sure to stop by! I have a table at the upcoming Philly Alt Comic Con! The festival takes place on August 14th, Sunday from 12-7PM at the Rotunda. I am excited to explore Philly for the first time! You can check out more details on the festival's official blog and Facebook. I'll have a couple new pieces in a show at Alternative Cafe in Monterey, CA! Curated by the ever talented Aya Kakeda and featuring all Brooklyn ladies, the show opens July 8th! Toronto! I'm coming your way!!! On May 7th and 8th, I'll be at TCAF, anticipated to be the show of the year! It will be my first time in Canada. :) I will have my new book "hot + cold" at my table, plus the rest of the goods. Working on my Portland recap on my blog as I type this, stay tuned! I'll be exhibiting at the Stumptown Comics Fest coming up in April! I'll have poster prints, totes, the silkscreen accordion book series along with the large books, and hopefully my newest book, currently in progress. Check out their site for more details and floor map, I will be at table E 5. Updated this place with some new work, check out the illustration section and also comics section. Enjoy, and happy holidays! Also, I have some teeny acrylic paintings in a show, exhibiting to the public for one night only. If you are in LA, be sure to stop by Gallery Meltdown for the "TINY too" show on December 11th, 6-9PM. Here's whats going on during this exciting month of October! I'm in a show called "The Art of Comics" at Oakopolis, where you can view uncut pages of my "rainbow & i" book banner style on the wall. The show opens tomorrow for First Fridays in Oakland so if you're in the Bay Area, check it out! This year I will have my own table at APE, exhibiting for the 3rd year in a row. (I love APE!) Find me at table #565. I will have tons of prints, small and large books, and new tote bags! APE takes place October 16-17 at the Concourse Exhibition Center, SF. I will have a new limited edition silkscreen print available in this show! The fourth annual "Crazy 4 Cult" show at Gallery1988 in LA opens this week. Visit my blog for photos and the process in making this new print. I have a couple of new pieces in this show at Gallery1988 in LA, dedicated to the sci-fi TV series The Twilight Zone! The show will open in a couple weeks, stay tuned for previews on the G1988 blog. I have new prints and paintings in this show! "Happy Ending" at Miss Scarlet in the Parlor. I am in another show with the folks at gallery meltdown, this time the theme is "Return to Oz", works inspired by the movie/novel. "Night of the Nick-Nacks." Opens this Saturday! I will be in a group show next month at gallery meltdown! (part of meltdown comics in LA) For those of you in southern California, be sure to check it out! This weekend I am exhibiting at APE, this year sharing a table with Jon Vermilyea! We will both debut our new silkscreen books. My new book is titled "rainbow & i" I'll only have a hand full of copies... so be sure to stop by! I'm really excited to be attending this year's MoCCA! Taking place June 6-7th. I'm in a panel Sunday. Check out the program guide. Two write-ups on "Sweet Surrender" that I'd like to share: ArtSlant, and Redefine Magazine. If you missed the show, (which just came down) you can view my femme-bot series here in the illustration section. The show opening was amazing! I'll post pictures soon on my blog. In the meantime, I've updated the illustration section with tons of new work. check it out! I'll be in town for this, for sure! I had a very good time at APE! It was also very successful, take a look at my blog where I talk more about it. 13th @ Fantagraphics Store, Seattle, WA. ----In light of the shop anniversary and the long awaited BEASTS! v.
I will have some garlic nymph prints in the show. I have a table at the upcoming APE con in San Francisco! If you're in the city and coming to the convention, come say hi. I will be selling pink lemonade books and prints. Come to SF! Stop by. Illustration section has been updated with lots of new work. Enjoy! at Metropolis, coming in September. Check out my blog for the press release!